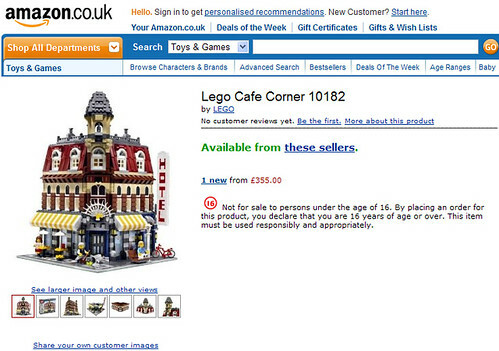 I found this Lego set on Amazon UK. It’s actually way more elaborate (and expensive) than any I remember seeing in the Australian catalogues, but what I thought was really funny was that Amazon has attached a legal-sounding age restriction to it, as if it was an adult video game or DVD, or alcohol. That’s right folks — responsibly and appropriately — which means no giving it to your 7 year-old and letting him pull all the pieces apart to make robots.